The technique for determining the movable (holes in the crank bearing) and fixed (grooves on the surface of the pad) lubricant sources for lubricant supply to the heavy-loaded friction type bearing is considered. To determine the field of hydrodynamic pressures in the bearing lubrication layer, two modifications are taken into consideration: the modification of the algorithm for integrating the modified Elrod equation for the degree of the gap feeling. Further studies showed that developed modifications were proved to be quite effective in calculating the characteristics of the lubricating layer for both statically and dynamically loaded bearings. However, for the first modification, numerical oscillations of the unknown function at the boundary of the reduction of the lubricating layer were noticed. The second modification, for which the finite difference algorithm was used, is characterized by the simplicity of implementation and the stability of the iterative procedure. The example of connecting rod bearings of the crankshaft of the combustion engine is used to consider the influence of the location of the lubrication sources on the hydromechanical characteristics of complex loaded friction type bearings. Original schemes of location of partial and complete oil distribution grooves for lubricant supply for connecting rod bearings are proposed. 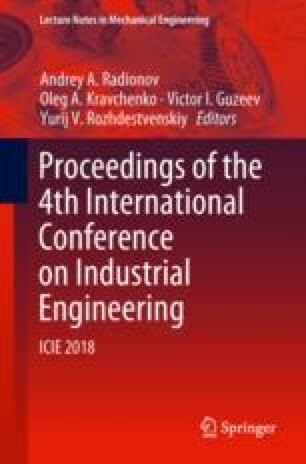 It is shown that an additional method for improving hydromechanical characteristics is the selection of engine oil with improved viscosity–temperature characteristics. The research presented in this work was carried out with the financial support of the Russian Foundation for Basic Research (project no.16-08-00990).